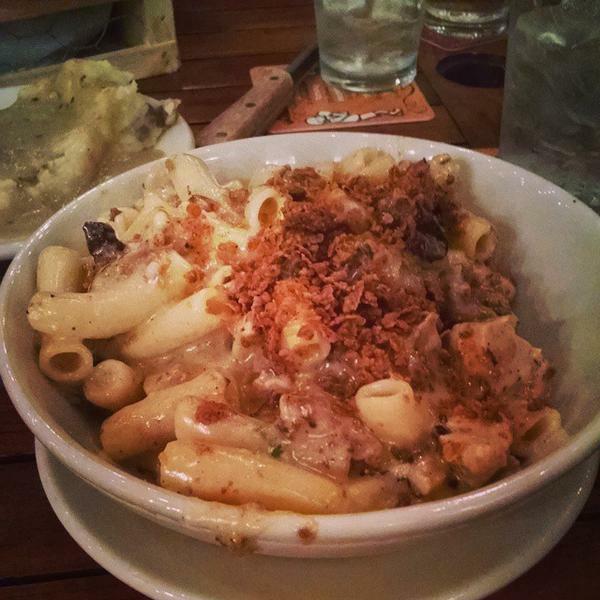 Our buttermilk fried chicken, chopped and tossed with housemade bechamel sauce & lots of Cabot cheddar caramelized with pasta. "...young crafts a menu of classic dishes such as macaroni and cheese, green bean and wild mushroom casserole (complete with a homemade onion ring garnish), and fried chicken..."
- Gayot"...main menu skip to content home about ann arbor blogroll calories house recipes shred travel zingermans roadhouse: brunch & dinner reviews this entry was posted on september 1, 2014, in ann arbor/ypsi nomeries, breakfast foods and tagged ann arbor, ann arbor restaurants, brunch, caprese burger, fried chicken, mac and cheese, zingerman's, zingerman's road house...my choice: fried chicken macaroni and cheese "our buttermilk fried chicken, chopped and tossed with housemade bechamel sauce & lots of cabot cheddar caramelized with martelli pasta." oh yeah...in addition to the chopped pieces of fried chicken incorporated into the macaroni in cheese, i also loved the crispy bits sprinkled atop the dish, which added the crispiness one expects with fried chicken...(#got ) though, my mac and cheese does not have fried chicken in it, so zingermans clearly wins the creativity points here..."